Left and bottom right: live abalone photographed by Sara Wickham (top left) and Wiebe Nijland. Note the algal (and possibly encrusting animal) growth on these individuals. Right:large shell photographed by Kelly Fretwell. A shell washed up on a beach is the most common way that most people will encounter this species. The latin translation of Haliotis, "ear of the sea," is an apt description of this species' ear-shaped shell. Much like a limpet, an abalone is only protected by a shell on one side. Unlike a limpet, however, an abalone's coiled and elongated oval shell is asymmetrical, and is punctured by a line of 3 to 6 holes on tubular projections. 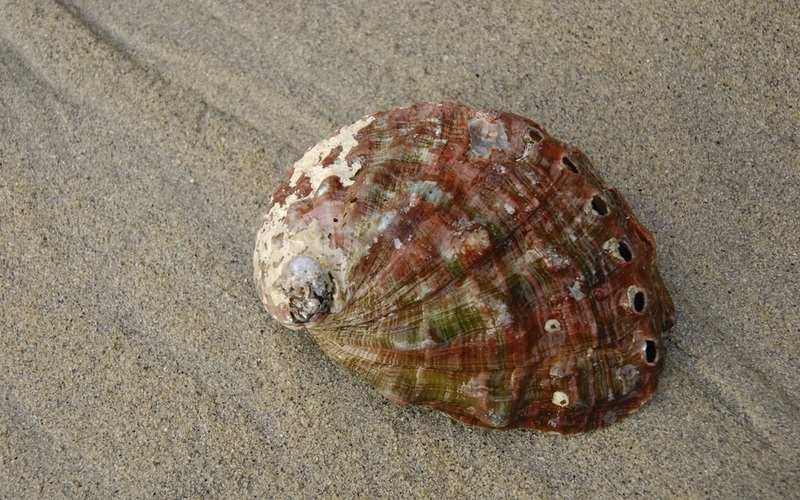 The shell exterior is mottled with green and reddish-brown, with some patches of white and blue — though the exterior may be overgrown with encrusting animals and algae. 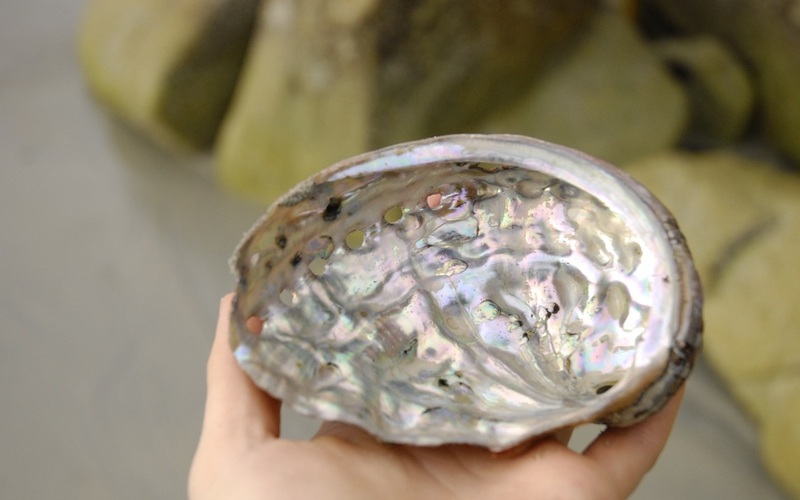 The inside of the shell is a beautiful pearly-white colour, with tinges of pink and green. The tentacles of live abalone may be seen poking out from around the shell edges, or through the respiratory holes that perforate the shell. Growing to about 18 cm across, this is is on average the smallest abalone species. Northern abalone is found in intertidal and subtidal areas to a depth of 35 m, though adults are most commonly found at around 10 m deep. Aggregations occur in rocky areas with kelp beds and good water circulation. Juveniles move around more than adults, and are more often found around encrusting coralline red algae instead of kelp. Northern abalone's BC distribution is patchy and along open coastlines. Its North American range stretches from Sitka in southern Alaska to northern Mexico. It is also found off the coast of Japan and Siberia. Though northern abalone numbers have drastically decreased since the mid-1900s, you are still much more likely come across it rather than the other two abalone species found along the Pacific Northwest coast. Flat abalone (H. walallensis) once existed on the BC coast, but there are no modern reports of it existing north of Oregon. Red abalone (H. rufenscens) is also not found north of Oregon, and is uncommon north of Monterey, California. Some efforts were once made to introduce it along the coasts of Washington and BC. 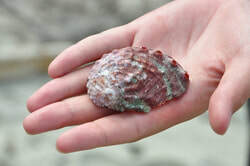 and there was one unexplained report some years ago of a few large red abalone found together off the west coast of Vancouver Island, but none have been found since. Northern abalone were traditionally harvested at a sustainable level by coastal First Nations groups for both their meat and their shells. Human harvest of this species increased through diving with the advent of SCUBA gear, and at one point large commercial and sport fisheries existed throughout the northern abalone range. It has been illegal to harvest abalone in Canada since 1990. Even the possession of abalone shells found on a beach will incur large fines unless proper authorization is obtained, which may be granted for official research purposes. The green and brown colouring on the exterior shell comes from pigments in the algae the animal eats. While the inside of a northern abalone shell is beautiful, it pales in comparison to the interior of other abalone species like the prized paua abalone of New Zealand, seen in this photo. Some shells may have swirly holes drilled into them; this is done by a very small bivalve called the abalone piddock and is not fatal to the animal. Check out other interesting facts about this and other abalone species at the Monterey Bay Aquarium abalone page. Conservation: northern abalone is listed as endangered on the International Union for Conservation of Nature (IUCN) red list of threatened species and by Canada's Species At Risk Act (SARA). This is a result of over-harvesting and poor fisheries management in the mid to late 1900s. 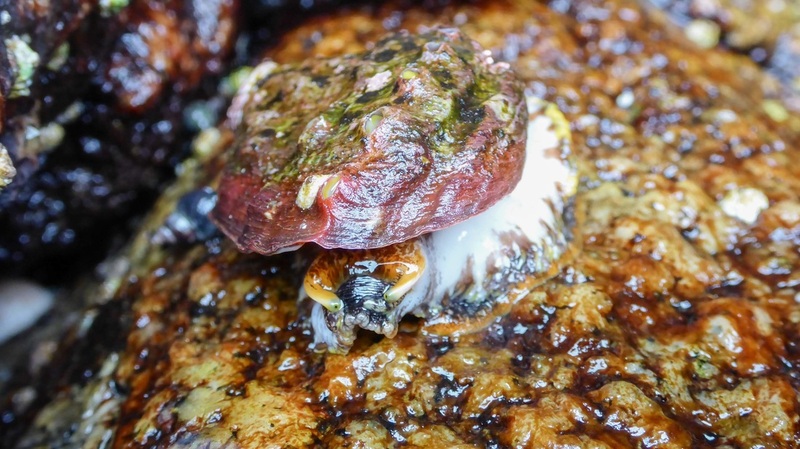 Northern abalone continues to be threatened today by illegal poaching. The species' population numbers are also under pressure from returning and increasing sea otter populations. Sea otters, which prey on abalone, are also threatened: they are listed as of special concern by the Species At Risk Act and as endangered by the IUCN. Furthermore sea urchins compete with northern abalone for food, and tend to experience population explosions when they aren't kept in check by predators such as sea otters. 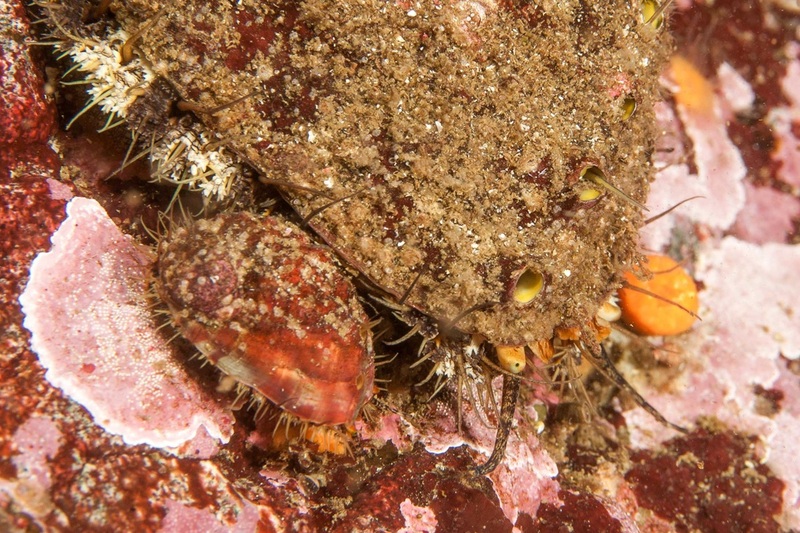 This makes northern abalone's recovery a difficult and complex issue. Read more about this complex issue on the northern abalone ARKive page and the IUCN and SARA listings. Government of Canada. (2012). Species Profile: Northern Abalone. Species at Risk Public Registry. Government of Canada, Ottawa. Accessed 03/07/2013. Haliotis kamtschatkana (Jonas, 1845). In Klinkenberg, Brian. (Ed.). E-Fauna BC: Electronic Atlas of the Fauna of British Columbia. Lab for Advanced Spatial Analysis, Department of Geography, University of British Columbia, Vancouver. Accessed 03/07/2013. 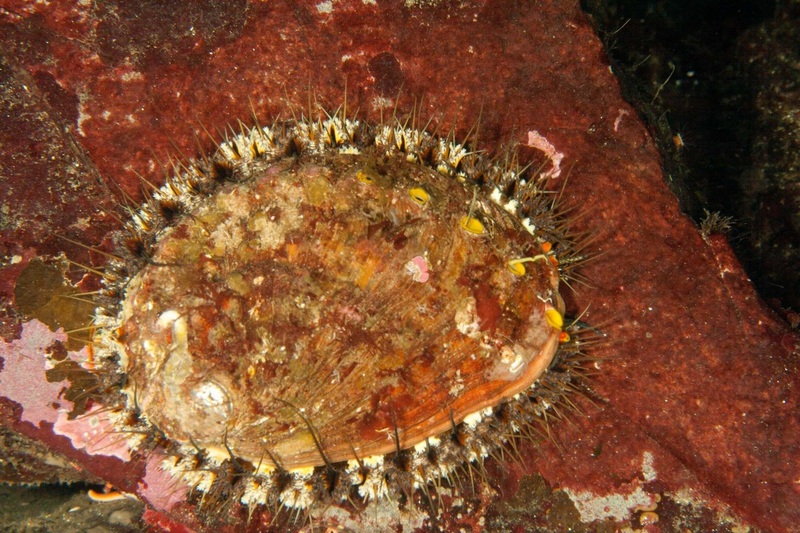 Northern abalone (Haliotis kamtschatkana). ARKive.org. Accessed 03/07/2013.